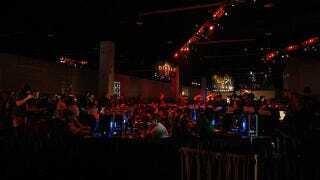 If you thought competitive StarCraft II in a bar was wild, wait until you see it amidst a throng of thousands of fans at BlizzCon 2011, home of the 2011 Global Battle.net Invitational and the 2011 Global StarCraft II League October Final. During my yearly sojourn to Anaheim for BlizzCon, I don't often touch on the eSports part of the show for two reasons. One, I'm too busy taking pictures of female Draenei cosplayers from behind. Two, if I get within 50 feet of a competitive StarCraft II match, I will automatically lose, regardless of whether or not I am playing. You can imagine how embarrassing that is. The competitive side of BlizzCon is for those made of sterner stuff. Past the booths selling action figures, masks, comic books, and novels; past the row upon row of computers teasing players with the latest build of Diablo III, there lies the eSports arena, a place where people that look at a StarCraft II screen and can tell you exactly what's going on feel right at home. The world's top StarCraft II players will begrudgingly sit next to the world's top World of Warcraft arena battlers this October in Anaheim. The action will be fast and furious. With a prize pool of nearly $300,000 between the two events, I'm secretly hoping somebody gets stabbed. Tastefully stabbed, mind you. None of this violent stuff. "Between the Global Battle.net Invitational and the GSL October Final, two of the biggest eSports events of the year will be taking place at BlizzCon 2011," said Mike Morhaime, CEO and cofounder of Blizzard Entertainment. "We're looking forward to witnessing the high level of competition between the pro gamers participating in these events alongside our attendees at BlizzCon and the viewers at home." BlizzCon 2011 has been sold out for several decades, but there's always the virtual ticket, on sale soon at the BlizzCon website. You'll probably get a better view of the action anyway.